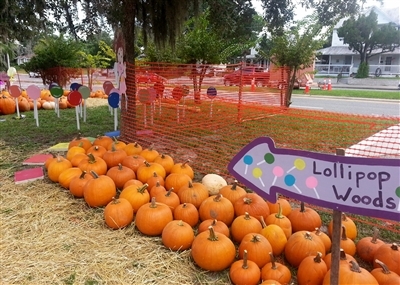 PORT ORANGE -- Those orange orbs of autumn played their part, but it was a Candy Land theme planned and executed by Roseanna Sorrell and the First UMC decorating committee that caught judges' attention and snagged a prize for having the most patch appeal in 2014. The honor, bestowed by distributor Pumpkin Patch Fundraisers, carried a $500 prize that will go toward decorating next year's pumpkin patch, said First UMC youth minister Tony Sorrell. The congregation's 2014 pumpkin patch raised about $12,000, of which $1,200 was tithed to the church and the balance split among the children's and youth ministries. First UMC's patch, which bested hundreds of other efforts competing in the Pumpkin Patch Appeal Contest, featured child-sized cutouts for the "Lollypop Woods" and other icons from the Candy Land board game. Congratulations, First UMC, Port Orange!